A study of material thinned from a 9-year-old Eucalyptus dunnii progeny trial revealed that E. dunnii has light yellowish wood that is relatively uniform in color, and varies little within and between trees. The variation in color between half-sib families is small, but is statistically signifi - cant (P = 0.008). Most of the color variation relates to the yellowness (CIE b*) of the wood, which in heartwood is moderately heritable (h = 0.6). The color of the endgrain, especially its lightness (CIE L*) and whiteness index (E313), is correlated with basic density, hardness, and rates of shrinkage. The CIE rectangular opponent scale (L*, a*, b*) appeared to be the most informative about wood color and properties, and no additional information was gleaned from an analysis of full spectral data in the range 400–700 nm. 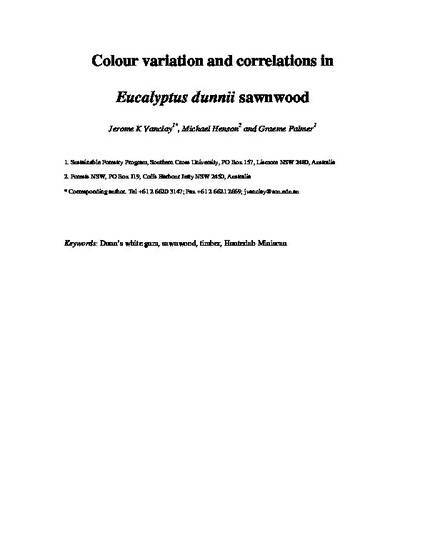 Pre-print of: Vanclay, JK, Henson, M & Palmer, G 2008, 'Colour variation and correlations in Eucalyptus dunnii sawnwood', Journal of Wood Science, vol. 54, no. 6, pp. 431-435.